Every November, farmers, craftsmen, artists, and culinary artisans descend on tiny Figline Valdarno, located just forty minutes from the heart of Florence, Italy. During the annual Autumnia celebration, visitors can immerse themselves in Tuscan country living and its myriad traditions. You can taste fresh olive oil grown on the surrounding hillsides, talk to the family growers, sample the region’s famous wines, and ask local vintners for their recommendations. The bustling streets are also filled with vendors of multi-colored fruits and vegetables and locally-raised smoked meats. Expert chocolatiers demonstrate their craft and offer free samples of their delectable wares. Artisan cheese makers, basket weavers, cane makers, and woodcarvers all ply their trades in the crowded market. 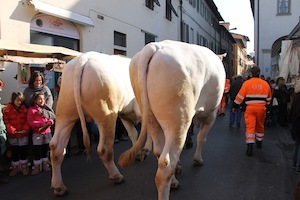 Don’t be surprised if you see horsemen clopping along the narrow cobblestoned side streets or a proud farmer leading his pair of prized Chianti bulls right through the crowd. The heady aroma of freshly roasted chestnuts fills the piazza along with the reverberating sounds of the village church bells tolling the end of Sunday services. The sights, smells, and sounds of Autumnia will linger with you long after the piazza is empty. 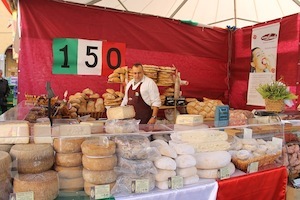 To explore the heart of Tuscany and get an up-close glimpse into the lives of people who are still steeped in the traditions of ancient Italy, plan to attend next year’s festival. You won’t be disappointed. The hearty smell of roasting chestnuts fills the air. 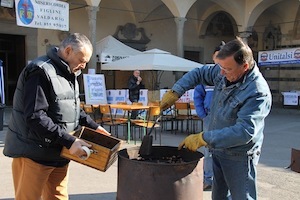 I stopped to watch two men scooping the fresh nuts from a smoking barrel of coals. 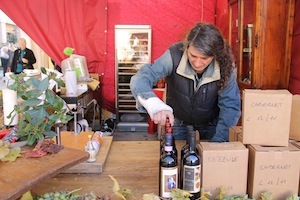 Making my way down the first corridor of booths, I watched a local family setting up their wine display. Family vineyards are in every corner of Tuscany and the Autumnia is a rare chance to get to meet the vintners in person and get the history and family lore behind the variety of wines you will enjoy sampling. The pungent aroma of crushed peppers and spices greeted me at a meat vendor’s booth. The butcher on call is more than happy to custom carve your orders or offer you samples of the endless smoked pork and beef goods. Around the next corner, I came face to face with colossal wheels of cheese of all sorts. 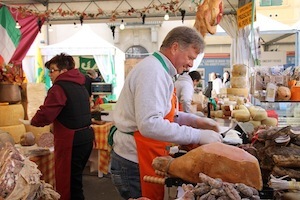 Everywhere you look, there are samples being offered of meat, cheese, olive oil, and bread. 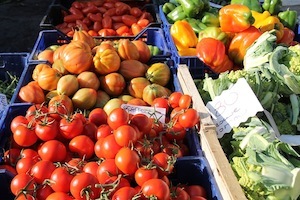 As I strolled through the fresh produce area, I saw smiling farmers with overflowing carts of tomatoes, peppers, artichokes, leeks, fruits of all kinds, and even fresh flowers. The noise of the festival was growing amid shouts of “Cia!” and laughter. The chilly morning air lends to the festive air. 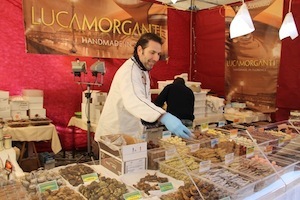 A smiling chocolatier busily arranged delectable samples from a famous Florence chocolate house, lending a cosmopolitan air to the Figline festival. The irresistible smell of melting chocolate blended enticingly with the steaming espresso cupped in my hands. 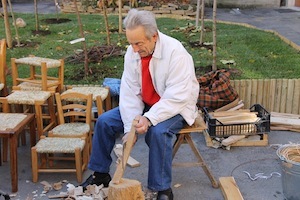 Coming to the end of the first row of vendors, I turned down a slender side street that opened into a small park-like area filled with dozens of craftsmen. 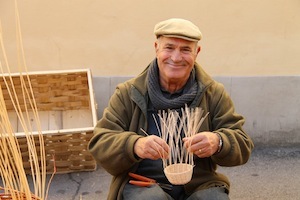 I politely asked this friendly basket weaver if I could take his photo. He agreed. Then, smiling, he pointed out that my camera still had the lens cap on, making this veteran photographer blush. 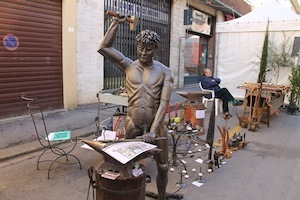 Turning a corner, I was startled to come face-to-face with a hammer-wielding statue in the blacksmith’s booth. I never saw the owner of that booth, but I imagine he was a confident sort, from the looks of the caretaker! Sitting across from the blacksmith’s booth was an elderly gentleman working steadily on a wooden table leg with his special curved knife. Never glancing up except to answer occasional questions, the quiet furniture maker apparently didn’t give his unusual neighbor a thought. Suddenly I felt a soft tap on my shoulder. 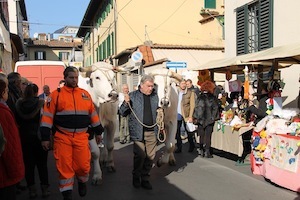 “Mi scusi… permesso.” As one of Figline’s finest politely parted the crowd, I looked behind me to see that he was making way for a proud farmer leading his prize stock to the animal exhibition area. The crowd around me murmured its admiration of the gargantuan beasts. As the immense animals passed, so close you could touch them, everyone smiled. The gentle giants walked slowly by, then the crowd closed back in their wake and once again I was surrounded with the bubbly chatter of children and the excited greetings of the festival goers.